The Japanese concept of continuous improvement, kaizen, is a staple of the world we live in today, as a means for many companies to ramp up productivity and reduce waste. While the process, made widespread thanks to Toyota, is meant to keep organisations competitive in a fast-moving world, it can also be used to make running changes to products, fixing certain issues that were not apparent during development. Take Proton, for example. When the national carmaker introduced its latest B-segment contender, the Iriz hatch, back in 2014, we remarked that it was a fundamentally solid car held back by a few glaring flaws. For all of the car’s safety credentials and impeccable ride and handling balance, we found fault with the car’s lack of refinement, less-than-perfect ergonomics and a few suspect quality issues. In the ensuing years, the company continued to make small but meaningful updates, most of them making their way into the Persona sedan in 2016. But even though the improvements were immediately palpable, the car was still a bit behind the competition in key areas, and the full potential of the platform remained untapped. The bulbous looks weren’t exactly pleasing to the eye, either. Now, with a fresh injection of capital from Geely, the company is taking a second stab at the cutthroat compact four-door market with the facelifted Persona, bringing with it a healthy list of fixes and upgrades. Are they enough to unleash the car we all thought it could be, however? Proton invited us for a short test drive at its Shah Alam oval, so we took the chance to find out. Proton said that it has made a total of 303 changes to the Persona with the nip and tuck. While that figure is slightly lower than the 367 on the also-facelifted Iriz, the company claims many of those extra parts were already on the sedan and were transferred to its hatch sibling as part of kaizen (there’s the word again). These changes are most apparent on the outside, taking inspiration from the new X70 SUV. At the front, the characteristic sweeping chrome trim, which spans across the entire width of the car, incorporates what Proton calls an “Ethereal Bow” design, now wrapping under the grille. This grille, by the way, features the “Infinite Weave” pattern that is set to become part of Proton’s design language moving forward. The outgoing model’s massive lower grille has also been slimmed down, while the air intakes flanking it (now with LED daytime running lights, a Persona first) have been made larger; a slim gloss black strip, running along the lower lip, ties it all together. At the rear sits a revised rear bumper with a Mercedes-like chrome strip, plus a new rear bootlid garnish with the Proton script and a standard-fit rear spoiler that extends the short rear deck slightly. A shark fin antenna and new 15-inch two-tone multi-spoke alloy wheels complete the look. As a whole, the aesthetic revamp makes for a much more cohesive design – while the jelly bean silhouette still grates (there’s not much you can do when the car’s height is shared with the Iriz), the rest of the elements work more harmoniously together to create the illusion of a wider stance. The new face is particularly successful, especially next to the Iriz’s that, to be honest, looks a little over the top. The Persona’s mug may be more conventional, but that’s not such a bad thing in our deeply conservative market, and it’s certainly the more handsome of the two. It’s a shame you still get halogen reflector headlights, however, especially as the Perodua Myvi gets LED items as standard. And just like before, only the top-spec Premium variant gets blacked-out pillars – the rest of the lineup has body-coloured items that look cheap. You’ll find a fair few changes on the inside as well. 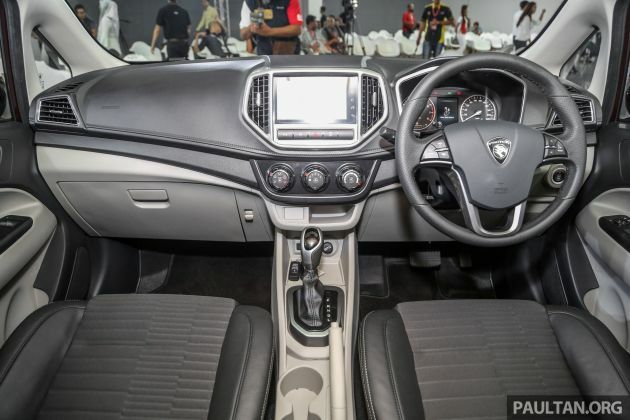 While the black-and-beige colour scheme remains, Proton has gone some way towards freshening up the somewhat dated interior, introducing a cool frameless rear-view mirror and the X70’s asymmetrical black-and-silver gearknob, complete with a leather boot – unfortunately, these are only fitted to the Premium variant. Not limited to the Premium is the part-leather upholstery, which is also offered on the mid-range Executive model. While some people may lament the disappearance of full-leather trim, it should be noted that the old faux cowhide was not at all pleasant to rest your bottom on, and the new fabric – which gets an interesting ribbed pattern – is far softer and has a fine weave that makes it feel surprisingly plush. Elsewhere, Proton has overhauled the tiny instrument cluster, and while the silver-trimmed dials still aren’t quite as big as I’d like, the cleaner design and typefaces do wonders for legibility. Eagle-eyed readers will notice the speedometer now tops out at 220 km/h instead of 240 km/h – likely to put 110 km/h, the national speed limit, at 12 o’clock – and the digital fuel and temperature gauges are now at the bottom of the dials. This frees up space on the centre multi-info display, which, by the way, has grown in size and is now a colour screen on the Executive and Premium variants, again improving clarity and allowing for fancier graphics. Speaking of screens, the two models also get a new infotainment system – a version of the Geely Smart Ecosystem (GKUI) developed in collaboration with ECARX. Running on Android and featuring a seven-inch touchscreen with multitouch capabilities, the system is also available with internet connectivity on the Premium model via a built-in eSIM, in a similar fashion to the X70. This adds online navigation and music streaming as well as the much-vaunted “Hi Proton” voice control. While you won’t be able to dazzle your friends by controlling the windows and air-conditioning (which is manual here, of course) through your voice, you can still ask the system to play a specific song or for navigation directions, which is still pretty handy. And while some of the English translations are still a little suspect, it’s at least all functional, and the speed through which you can operate the system – especially the way you can cut off your virtual PA mid-sentence – is particularly impressive. Proton has been making big claims about its measures to improve the quality of its products, saying that it aims to close the gap with Geely and Volvo – and from what we can see, those claims hold water. Everything from the way the doors close to the operation of the previously clacky air-con controls had a tauter, more deliberate feel to it, and there’s nicer fabric headlining to boot. The company has also added features such as a driver’s-side auto up/down window (previously only auto down) and automatic headlights – items that were on the Iriz (prior to the 2017 update) but removed on cost grounds. Unfortunately, it hasn’t seen fit to improve the car’s safety kit as well, so while stability control is still fitted across the board, only the Premium gets the full complement of six airbags. There’s no autonomous emergency braking, either, despite Proton having tested the system on an Iriz since 2014. Cabin space has never been the Persona’s strong suit, so you’re still not going to get segment-busting rear legroom here, as is the case with some of its rivals. Even so, there’s a decent amount of space to stretch out and plenty of headroom; the boot is also generously sized at 510 litres, though the large amount of wheel arch intrusion means there’s a little bit less usable space than that figure suggests. The existing 1.6 litre VVT naturally-aspirated four-cylinder petrol engine soldiers on here, producing 107 hp at 5,750 rpm and 150 Nm of torque at 4,000 rpm and paired to either a five-speed manual gearbox or a continuously variable transmission. The company said that it has retuned the CVT for improved fuel consumption with the assistance of Geely, which utilises the same Punch unit in some of its vehicles. Proton claimed that it has incorporated the learnings of both companies, and while we were limited to just a few rounds on its high-speed oval, the improvement in drivability of the CVT model was obvious from the get go. The outgoing car was already pretty responsive to throttle inputs but here it was quicker still, even though it lacked the instantaneous stepped feel of a torque converter unit – like you’d find on the Honda City. Instead, the Persona delivered its ample performance in a smoother, more gradual manner, which admittedly made for a less sporty feel but, conversely, a more comfortable drive that some people might prefer. Adding to that, Proton expended a lot of effort in reducing noise, vibration and harshness, on top of the redesigned engine mounts and new exhaust system that were introduced on the previous model. Although the company did not elaborate on the changes, the difference was palpable. While the Iriz/Persona’s trademark boomy engine note had not been completely expunged, it was considerably quieter than before. Road and wind noise was also slightly lower, only becoming obvious at higher speeds. Better still, the vibrations through the steering wheel and pedals that afflicted the original Iriz – and made that car quite tiring to drive over long distances – had been pretty much wiped out, thanks to a new dynamic damper. These improvements should make for a more relaxing drive, clawing back the ground lost to the Persona’s more refined Japanese competitors. Being on an oval meant that we were unable to thoroughly assess the car’s handling characteristics, but even so it was clear the Persona’s key strengths remained intact, including its impressive stability, tidy body control and accurate steering (albeit with a slight dead spot on-centre). Unfortunately, while improvements were made to the car’s braking performance, the middle pedal was still much too soft to inspire confidence. 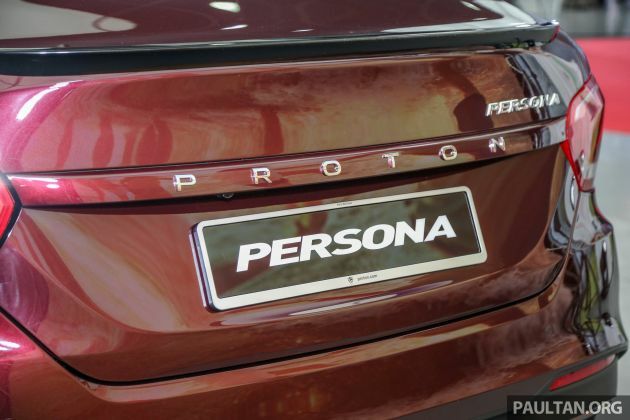 Lastly, to counter the perception of its cars being more expensive to maintain, Proton claimed that the Persona has, on average, 32% lower servicing costs compared to rivals like the Perodua Bezza and Honda Civic. 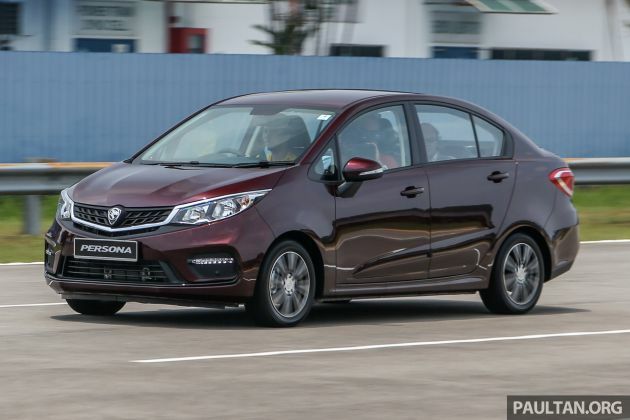 Perodua has since hit back, saying that Proton included the Bezza’s optional Pro-Care maintenance package into the equation, and that true maintenance costs amounted to just 1.4% more than the Persona. You can read our full comparison of the prices here. Ultimately, the facelifted Persona represents an impressive makeover that should make this a more appealing offering in the B-segment market. Moreover, it’s great to see that Proton is still putting the effort into iterating its existing models, despite the success of its X70. It would’ve been easy for the company to lean on its SUV for survival – especially as it continues to set record sales figures. 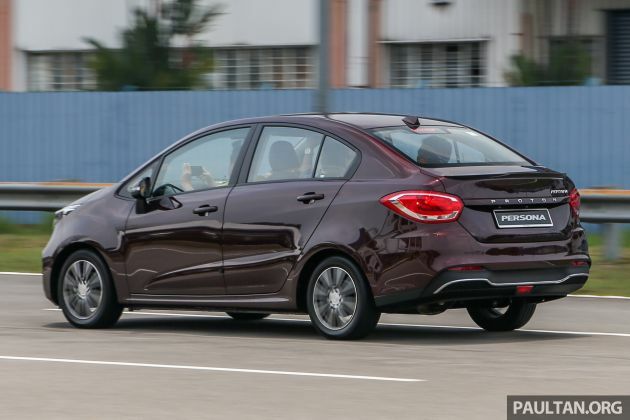 But it can only truly succeed by continually churning out new and updated models, and by leaning on the strengths of both itself and its strategic partner, Proton has come out with a product that finally realises the potential we saw all those years ago. Ugly. That wheels with that big body.. Please, dont let this thing appear on our road..
2019 Proton Persona facelift – “a quick sample”. Albeit using “sample” has got local flavour, “a quick review” definitely more apt. Please check YOUR own usage of ALBEIT. A written review. Much appreciated. Thank you for reading reader feedback. P1 took the lessons they learn about Kaizen from ex-Jepunis lord and use it to pancung the celup Jepunis! Lolz! So in this real pic persona rims & wheels look so tiny, but i see in their website they edited the persona rims & wheels look so big. Try check it out guys. Small you say it’s tiny, bigger one you claimed expensive to replace and tough to look for variety of tyre choice due to special size. Better of you get your own 15.5inch and make your own rubber on belt. The plastic engine cover finally has a decent finish without the shiny silicon spray look. Change to aftermarket wheels lah. Look at City, Vios, Bezza,Iriz…notice how skinny their tires are? Even the old camry had skinny tires. Even if the tires is larger in diameter, the thread width is soo small making the car look weird and tires more expensive in certain case as the size is rare. the car still looks higher than average cars. i don’t understand why must it be so high making it look so flimsy. Would be cool if center tray in front of cigarette lighter is a wireless charging pad. Mini Cooper is smaller than this car but much more expensive. People still buy Mini Cooper. Why is it I see very few Personas on our roads if the car is supposed to be so good? You should step out more often. The persona and iriz should follow x70 strategy to be successful that is being a great value for money compared to its rivals. If x70 can have all the bells and whistles and being 50k less than a similarly specced rival, why cant persona and iriz be the same? The percentage of saving is bigger in the Persona. Let’s say comparing Persona Premium and Vios G: Rm54k vs Rm87k, Persona is 38% cheaper than Vios. Just for reference, X70 Premium is around 28% cheaper than CRV TC Premium. Hihihi, they took a jab at their competitor again. This style of competition is good for consumer. I would love to see if they will do comparison of body structure strengh…This will surely raised eyebrow in Malaysia. Car that we thought safe due to localise NCAP rating is rubbish compared to international std. This is minus all the electronic aid. There are reason where some make is much heavier compared to others in the same category and its not down to equipment. 8,000 people disagrees with you. 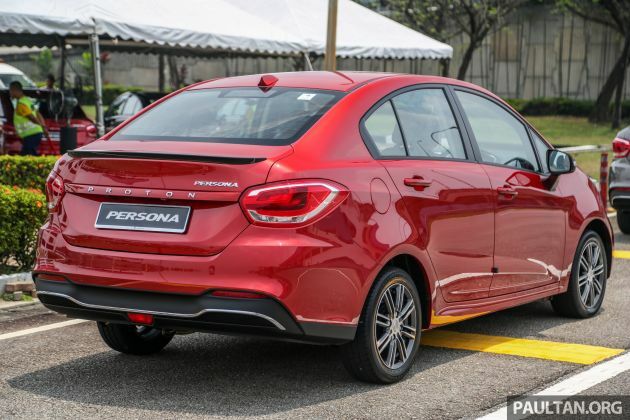 The New Persona is the perfect example of Proton Designers taking compromises too far, allowing a Sedan to be built on a Hatch platform. Better to just do a heavy update on the 2007-2016 Persona! Its more proportionate. Really now? Have you so conveniently forgotten about 2nd gen Dugong Vios or 4th gen bulbous Flowerhorn City? Persona at least looked better in the rear compared to those two. It is obvious for sake of economy that 2nd gen Persona is based on Iriz and for sure the next Persona will be more distinctly sedan. That goes without saying. The old 1st gen Persona platform is too outdated and can’t accept all those new safety features of the current gen. I was hoping that they would reduce the roofline by 2 inches. In my opinion that would improve the way the car looks and make it sleeker. But I guess the cost would be unbearable and unrecoupable by Proton. Have u actually experience the fc on long term basis? If not then no use explaining to you. Vios dugong was here first. Even botox cant fix this ugly stepchild with identity crisis. Proton cars are like fine wine. It takes time to mature but once it has proven, it is sooooo much more satisfying. Still dinosour campro engine inside.. Ok next!